The Triple Threat to Millerground. National Trust land at Millerground, on the east side of Windermere, is one of the few public access points to the lakeshore and is a very popular lakeside walk. 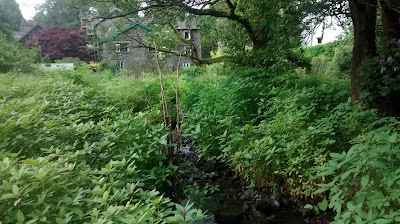 Wynlass Beck flows through Millerground and then into Windermere. 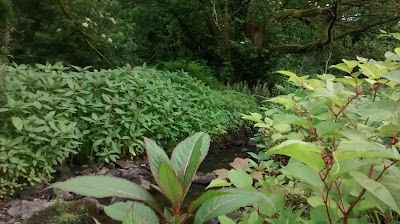 Just a short distance upstream there is a large area of disused land where non native invasive plants have been allowed to run riot. Unfortunately invasive plants, as their name implies, are very good at working their way downstream spreading into and dominating new areas very quickly. A great deal of work goes into keeping National Trust land at Millerground as free as possible from these invasive plants, either through pulling them up, digging them out, or using chemicals as a last resort. (1) Himalayan Balsam. Each plant may produce upwards of 800 seeds. 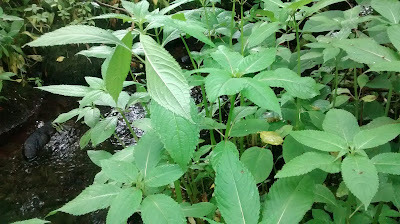 Many of these seeds are carried downstream and this is how Himalayan Balsam is able to spread so rapidly. (2) Japanese Knotweed. The hardest invasive plant of all to eradicate. It reproduces vegetatively; if even small pieces of its root system or rhizomes are able to find their way downstream* new stands will quickly become established. *This is particularly likely to happen during floods or heavy rainfall. 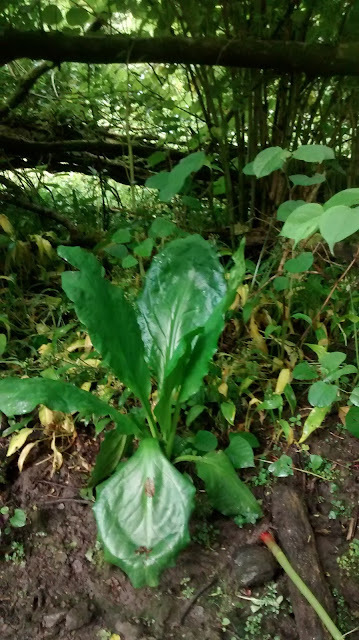 (3) Skunk Cabbage is a comparatively new invasive on this watercourse but if left can soon spread very quickly. Most years now Skunk Cabbage is found at Millerground and sprayed. Images of how bad it can get when invasive plants are left unchecked. Wynlass Beck upstream from National Trust land at Millerground. 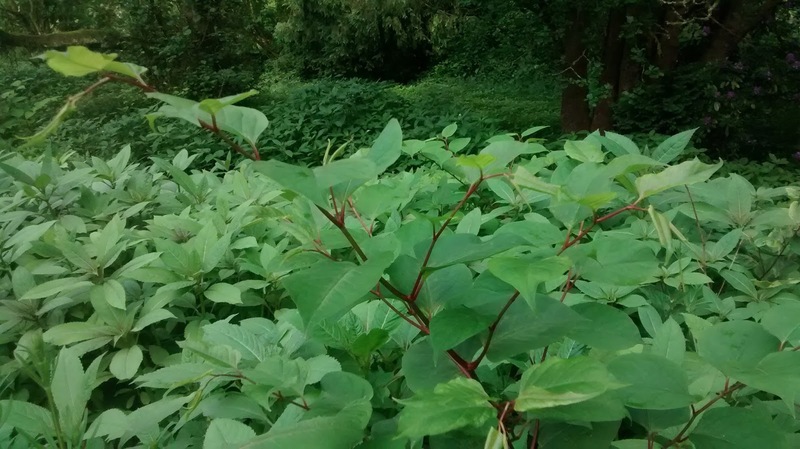 The sheer number and density of invasive plants is overwhelming. 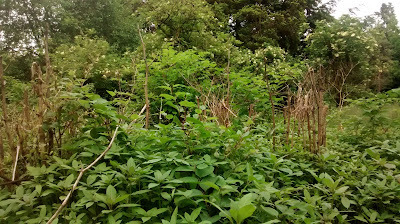 Vast stands of Himalayan Balsam and Japanese Knotweed have taken over this area. It is appalling. Millerground, being so close, is very vulnerable. 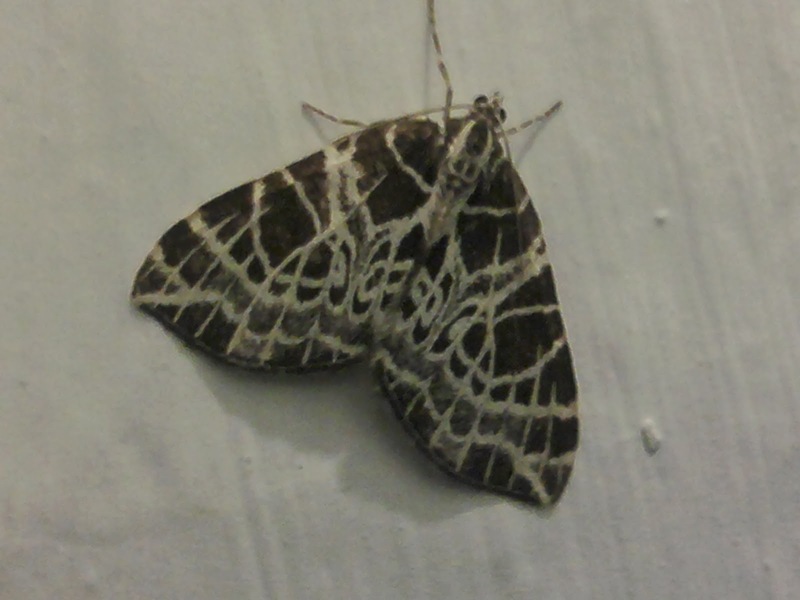 The Netted Carpet Moth and the BBC at St. Catherine's. The BBC Natural History Unit plan to film and tell the story of the rare netted carpet moth and its reliance on touch-me-not balsam, a 'nationally scarce' annual plant. The moth is on the wing between mid July and August. Females lay eggs singly on the balsam. The yellow flowers are followed by pods that burst with explosive force when ripe...scattering seeds far and wide! The Lake District is a stronghold for the moth and the balsam albeit at just a few sites. The BBC have chosen one such site at National Trust St. Catherine's for some film work. Conservation work at St. Catherine's, East Windermere, has resulted in many touch-me-not balsam plants growing annually in the wooded area just south of the Footprint building; there has been a corresponding increase in the annual moth populations. Emma, the producer and Tom, the cameraman, are setting up the camera on a post for time lapse photography of the balsam plants. (Thursday evening, 11th June). The Footprint seen from a point further back in the wooded area. To give a measure of protection to the touch-me-not-balsam, James, N.T Area Ranger, is erecting a rope barrier. The caterpillar, the flower and seed pod. By October the caterpillars will have pupated, emerging as moths in July. The image above was taken in late August just six metres from the Footprint steps! Other posts relating to the netted carpet moth and touch-me-not balsam are on this blog site. Images from The Grasmere Gallop 2015. Helm Crag overlooking the event. Susie and Lizzie warming up before the run. Iain, piping the competitors to the start. And they are under starter's orders. Drinks Marshals at Station D.
Part of the 10k course around Rydal Water. Robin, 17k competitor, with his 'Runner's Medal'. My name is Pete and I work as an academy ranger for the Trust in the Lake District. The academy scheme provides training, both theoretical and practical, to those with passion but without the background skills or knowledge. Myself and Bruna – an academy ranger based in Snowdonia – have recently spent a week at Blakeney Point in North Norfolk to help the team monitor a variety of sea birds and learn from them. The ability to work between sites is one of the key strengths of the academy programme. Sharing best practice not only saves the time of wheels being reinvented, but is also a great way to be re-inspired and share time with like-minded people. Preserving areas for the next generation is not always an easy task, especially when it can mean change for the current generation, and the challenges that this change brings. However, we share the belief that conservation is worthwhile. We have been gifted with a glorious planet and so of course we want to share it with others – a little compassion goes a long way. The ability to engage, educate and inspire is just as important as practical skills, as we need future supporters, members and volunteers to continue our work indefinitely. It turns out meeting our core target of “for ever, for everyone” is quite a task! Education and engagement can prevent misunderstandings occurring. For example, the site of a tree being cut down can easily evoke mental images of mass deforestation. But with vast timber imports from Europe and further afield a sustainable wood industry is vital to stop deforestation elsewhere, especially in countries with less stringent controls. Conservation is a truly global concern and so it is important not to become too fixated on making our grass green if that comes at the expense of the metaphorical grass elsewhere. Wood is often a bi-product of our core woodland aims of habitat management, visitor safety and access. Having a varied age structure, different light levels and allowing some trees to reach maturity of a large girth (providing nesting holes/deadwood habitat) are important for a valuable habitat, and as such some trees are removed. Good communication is key. With such a large organisation this can occasionally be difficult but staff and volunteers are committed to sharing our passion, knowledge and expertise. Here at Blakeney, coastal ranger Ajay Tegala and the team do a fantastic job, speaking to almost every visitor to the point. This not only helps to educate and inspire the visitors but enables the rangers to point out safety concerns and help protect the vulnerable ground-nesting birds and fragile sand dune, salt marsh and shingle habitats. String fencing and signage deters boats from mooring in the tern colony (sandwich, common, little and arctic) and near other ground-nesting birds. We were extremely lucky to be greeted on our very first evening by a friendly visiting Bluethroat (Luscinia svecia).The Bluethroat was once a regular migrant to Blakeney Point, sometimes in numbers up to 25, but declined in the 60's and by the 80's were rare visitors. There is now just one Bluethroat spotted almost annually, and rarely two, so this was a great site to see. Another interesting sighting during beach patrols and nest surveys was several Garden Tiger (Arctia caja) and Brown Tail (Euproctis chrysorrhoea) moth caterpillars. The only access to Blakeney Point is by the seal boats (externally run boat tours) or via a three-mile shingle walk from Cley beach – suffice to say, the ridge between the boat landing and the Lifeboat house (pictured at top of blog) is the busiest part of the Point! This also happens to be where several Oystercatchers (Haematopus ostralegus) choose to “nest”. I use the inverted comma's because their idea of a nest is simply laying eggs on the floor into a small scrape in sand, grass or shingle. They lay one egg a day to a total of four – however, females will sometimes share nests, hence the five eggs we found in one nest! This means they can share incubating duties and have extra defence against gulls (particularly common and herring) and other predators. In order to protect the eggs from accidental damage, and minimise stress to the female, we erected temporary fences around each new nest. On Wednesday we were joined by two ecology consultants from ECON to survey the local fish population in relation to the food supply for little terns (Sternula albifrons) and sandwich terns (Thalasseus sandvicensis). We used a 50m net in Pinchen's creek, using smaller nets and buckets to remove the fish and crabs, take measurements and then return them to the water. Species found included Bass, Herring, Lesser and Greater sand eels, Flounder, Crangon and plenty of crabs. The plan is to return to survey at different tide levels and build more robust figures. Over at Blakeney Freshes, ranger George took us out to monitor a variety of nesting birds. George was himself an academy ranger at Blakeney before securing his permanent role. There were a few Oystercatchers and lapwing still on nests but the avocets and a pair of lapwing already had chicks, who seemed to be doing well. Large drainage channels and sluices were dug out last year with the help of the RSPB to help regulate water on the freshes, and new scrapes dug out by digger with small islands. The avocets in particular took well to this improved habitat. The spot of the day was a pair of little ringed plovers with three chicks in tow, with a third adult being chased away by the pair. This may mean there is a second breeding pair – fantastic news for this schedule one species, which has just 1,200-1,300 nesting pairs in the UK. We both had a fantastic time and have learnt a huge amount - not least how to live for a week without running water or mains power - some of which we will be able to take back to our properties and use again in the future. Ten academy ranger positions are advertised near to the start of each year across England, Wales and Northern Ireland - please visit National Trust jobs for this and more.